Above is the Kazan Mother of God myrrh streaming Icon. September 25, 2014 Reported [here]. Rough translation from Russian. In the house of a resident of Barnaul Tatiana Vasilchenko a miracle happened. 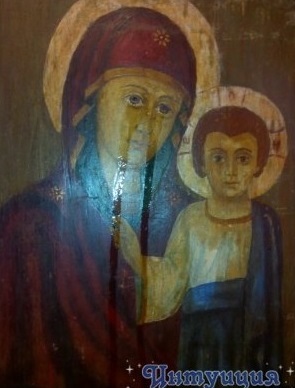 An Icon of Kazan Mother of God began to stream myrrh. The first tears of the Mother of God the eyes stood out August 28.The day of the Assumption of the Virgin, says Tatiana. After 24.00 hours of the right eye of the Virgin tears flowed, then there was a second. As tears streamed straight paths. But over time they have become more abundant around the Virgin's face. By September, the eighth Our Lady's of left eye a tear, contradicting the laws of physics, a tear ran down the left - to the person of Jesus. And parallel to the eye became run down explained Tatiana. That night the Child Jesus had a tear of blood.Tears flowed and froze. And from the eyes of the Virgin tears continued to flow. Sometimes it happened that all the icon was covered with an oily layer. It was as if it had just been painted, In addition, the icons paint become more saturated. Now the icon continues to weep. Tears do not have time to dry. By the way, Our Lady of tears have a peculiar pleasant aroma. 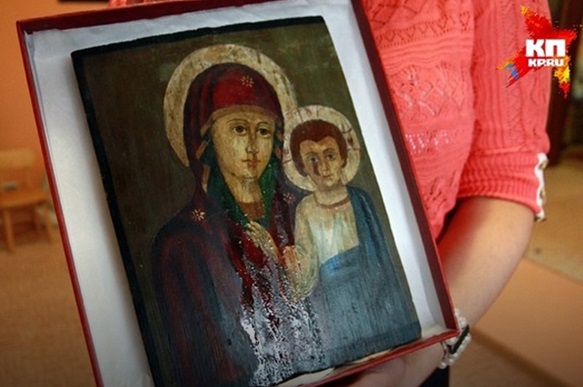 Tatiana brought the icon to the Diocese of Barnaul, there have confirmed that it is - a true miracle and a true mirotochenie. According to the woman, the exact origin of the icon in the family no one knows. Icon passed through the female line and went to Tatiana from her great-grandmother. We have a photo of 1913, when the great-grandmother was born only. So, this icon has been in their family. It turns out that she was more than a hundred years. More about the icon does not know anything. By the way, to touch the miraculous icon can now be anyone. It is stored in the center of Intuition st. Guerrilla 122.